An aerobatic aircraft is an aerodyne (a heavier-than-air aircraft) used in aerobatics, both for flight exhibitions and aerobatic competitions. Most fall into one of two categories, aircraft used for training and by flight demonstration teams, which are often standard trainers or fighters, and aircraft especially designed for aerobatics, usually at the expense of other attributes, such as stability, carrying passengers or endurance. Dates are of first flight. ^ Williams, Neil (1975). Aerobatics. L.R. Williams, Illustrator. Surrey, England: Airlife Publishing Ltd. pp. 32, et seq. ISBN 0-9504543-0-3. Wikimedia Commons has media related to Aerobatic aircraft. The Stampe et Vertongen SV.4 is a Belgian two-seat trainer/tourer biplane designed and built by Stampe et Vertongen. The aircraft was built under licence in France and Algeria. The SV.4 was designed as a biplane tourer/training aircraft in the early 1930s, the first model was the SV. 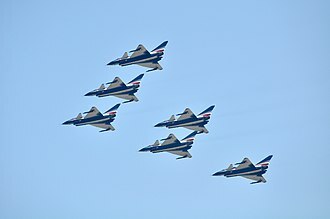 4A, an advanced aerobatic trainer, followed by the SV. 4B with redesigned wings and the 130 hp/97 kW de Havilland Gipsy Major. Only 35 aircraft were built before the company was closed during the Second World War, after the war the successor company Stampe et Renard built a further 65 aircraft between 1948 and 1955 as trainers for the Belgian Air Force. A licensed SV. 4C version was built in France by SNCAN, and in Algeria by Atelier Industriel de lAéronautique dAlger, the postwar SV. 4Cs were widely used by French military units as a primary trainer. Many served in aero clubs in France, numbers of which were sold second hand to the United Kingdom and other countries. SV.4 prototype SV. 4A aerobatic trainer with 140 hp/104 kW Renault 4-PO5 engine SV. The Tipsy Nipper T.66 is an aerobatic light aircraft, developed in 1952 by Ernest Oscar Tips of Avions Fairey at Gosselies in Belgium. It was designed to be easy to fly, cheap to buy and it was designed for both factory production and homebuild. Nipper was the nickname of Ernest Tips first grandchild, the first aircraft flew on 12 December 1957, with test pilot Bernard Neefs. It featured a cockpit and had a length of 4.56 m, a span of 6.0 m. The aircraft has a steel tube fuselage and rudder with a wooden and fabric covered wing, tailplane. It weighs 165 kg without an engine, early aircraft were equipped with a 40 hp Stamo Volkswagen air-cooled engine with types using either 40 hp Pollman-Hepu or 45 hp Stark Stamo engines. Production was between 1959 and 1961 with Avions Fairey delivering 59 complete aircraft and 78 kits, Avions Fairey stopped production to make capacity available for F-104G Starfighter assembly for the Belgian Air Force. During 1962 the rights and an assortment of uncompleted parts were sold to Cobelavia SA -Compagnie Belge dAviation. The de Havilland Chipmunk was the first postwar aviation project of de Havilland Canada. Today, over 500 DHC-1 Chipmunk airframes remain airworthy with more being rebuilt every year, the Chipmunk was designed to succeed the de Havilland Tiger Moth biplane trainer that was widely used during the Second World War. Wsiewołod Jakimiuk, a Polish prewar engineer, created the first indigenous design of the aircraft at de Havilland Aircraft of Canada Ltd and it is an all-metal, low wing, tandem two-place, single-engined aircraft with a conventional tailwheel landing gear and fabric-covered control surfaces. The wing is fabric-covered aft of the spar, a clear perspex canopy covers the pilot/student and instructor/passenger positions. CF-DIO-X, the Chipmunk prototype, flew for the first time at Downsview, Toronto on 22 May 1946 with Pat Fillingham, test pilot from the parent de Havilland company, at the controls. The production version of the Chipmunk was powered by a 145 hp inline de Havilland Gipsy Major 8 engine while the prototype was powered by a 145 hp de Havilland Gipsy Major 1C. Three Chipmunk aircraft serial numbers 1,10 and 11, were evaluated by the Aeroplane, as a result, the fully aerobatic Chipmunk was ordered as an ab initio trainer for the Royal Air Force. 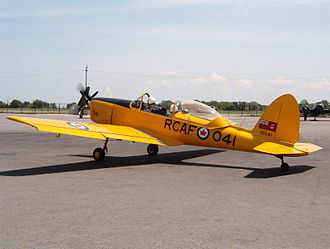 The Royal Canadian Air Force adopted the Chipmunk as its primary trainer, british-built and early Canadian-built Chipmunks are notably different from the Canadian-built RCAF/Lebanese versions. From the 1950s onward, the Chipmunk became a civilian aircraft, being used for training, aerobatics. A cabin development of the Chipmunk with side-by-side seating was designed as the DHC-2, the RAF received 735 Chipmunks, designated de Havilland Chipmunk T.10, manufactured in the UK by the de Havilland parent company to Air Ministry specification 8/48 as a Tiger Moth replacement. 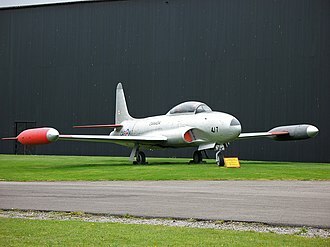 Production began at the DH Hatfield factory but soon transferred to their plant at Hawarden Airport and they initially served with Reserve Flying Squadrons of the RAF Volunteer Reserve as well as the University Air Squadrons. Chipmunks were pressed into service in Cyprus on internal security flights during the conflict in 1958, eight disassembled aircraft were flown out in the holds of Blackburn Beverley transports. The Nanchang CJ-6 is an aircraft designed and built in China for use by the Peoples Liberation Army Air Force as a basic trainer. The CJ-6 is an all-original Chinese design that is mistaken for a Yak 18A. Its predecessor, the Nanchang CJ-5, was a version of the Yak-18. However, advancements in pilot training brought a need for a new aircraft with improved performance, when the Soviet Union developed the Yak-18A, PLAAF engineers decided that its performance and design would not suit Chinas needs. A few important Chinese aircraft designers were involved in design task of CJ-6, Lin Jiahua, Xu Xunshou, during late 1957 Aeronautical Engineers Cheng Bushi and Lin Jiahua began work in Shenyang on a trainer design that addressed the shortcomings of the Yak-18A. The design they delivered featured an aluminum semi-monocoque fuselage, flush-riveted throughout, the dihedral and an angular vertical tail distinguish it externally from the otherwise rather similar Yak-18A. The first flight of the CJ-6 was completed on August 27,1958 by Lu Maofan, in 1965 the HS-6 engine was upgraded to 285 hp and redesignated the HS-6A, and the aircraft equipped with the new powerplant were designated the CJ-6A. It is expected Hongdu/Yakovlov joint developed CJ-7 Trainer primary trainer will replace CJ-6s in PLAAF, one thing to note is that the Nanchang CJ-6 makes extensive use of pneumatics to control the gear and flap extension/retraction, operate the brakes and start the engine. An engine-driven air pump recharges the system, however if air pressure is too low to start the the onboard air tank can be recharged by an external source. If an external source is not available the engine can be started by hand swinging the propeller, hongzhuan-502 Initial designation of production CJ-6 aircraft. CJ-6 Two-seat primary trainer aircraft, powered by a 260-hp Zhuzhou Huosai HS-6 radial piston engine, CJ-6A Improved version, powered by a 285-hp Zhuzhou Huosai HS-6A radial piston engine. CJ-6B Two-seat armed border patrol aircraft, powered by a 300-hp Zhuzhou Huosai HS-6D radial piston engine, bT-6 Export designation of the CJ-6 and CJ-6A. PT-6A Export version of the CJ-6A Haiyan A Haiyan Prototype, first flew on August 17,1985. The Embraer EMB312 Tucano is a low-wing tandem-seat single-turboprop basic trainer with counter-insurgency capability developed in Brazil. 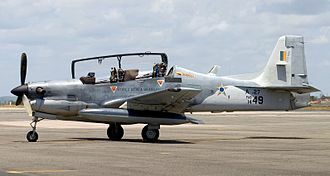 The Brazilian Air Force sponsored the EMB-312 project at the end of 1978, design and development work began in 1979 on a low-cost, relatively simple new basic trainer with innovative features which eventually became the international standard for basic training aircraft. The prototype first flew in 1980, and initial production units were delivered in 1983, production was initially supported by a local order for 118 aircraft with options for an additional 50 units in October 1980. 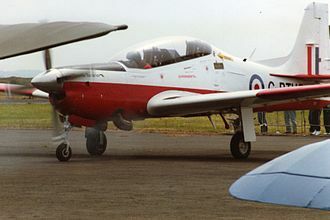 It was matched by an Egyptian licence-produced purchase in 1993 and subsequently by a variant known as the Short Tucano. The Tucano made inroads into the military trainer arena and became one of Embraers first international marketing successes, a total of 664 units were produced, flying in sixteen air forces over five continents. 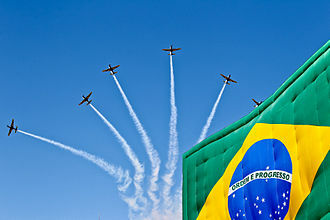 The Brazilian military government considered aircraft strategic equipment, and in an effort to reduce dependency from foreign companies, after all-jet training program trials during the 1950s, a variety of propeller-driven aircraft were used for pilot training during the 1960s and 1970s. In the 1970s oil prices increased with the price of a crude oil barrel having risen from $3 in 1973 to $36 by 1980. At that time the Brazilian Air Force operated the J69-powerered Cessna T-37C, during the 1970s the Brazilian Air Force operated over one hundred piston-powered Neiva Universal basic trainers. Two years later, the company was acquired by Embraer, in 1973 designer Joseph Kovács moved from Neiva to Embraer, bringing with him a number of studies based on the Neiva Universal including a development of the tandem-seat turbo-prop Carajá. 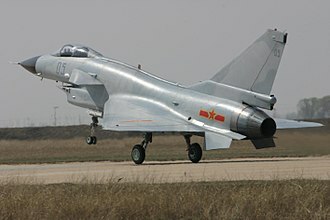 None of the proposals were acceptable to the Air Force but interest was expressed in the higher performance EMB-311, on that same year, the Ministry of Aeronautics released a new requirement. Therefore, in January 1978, Embraers design team, which was led by Guido Fontegalante Pessotti and included Joseph Kovacs, on 6 December 1978, Embraer was officially awarded a contract to produce two prototypes and two airframes for fatigue tests. The specifications were concluded in February 1979, and the differences from the EMB-311 were the more powerful PT6A-25C engine, raised rear cockpit. 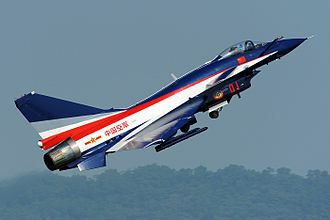 An aircraft is a machine that is able to fly by gaining support from the air. It counters the force of gravity by using either static lift or by using the lift of an airfoil. The human activity that surrounds aircraft is called aviation, crewed aircraft are flown by an onboard pilot, but unmanned aerial vehicles may be remotely controlled or self-controlled by onboard computers. Aircraft may be classified by different criteria, such as type, aircraft propulsion, usage. Each of the two World Wars led to technical advances. Consequently, the history of aircraft can be divided into five eras, Pioneers of flight, first World War,1914 to 1918. Aviation between the World Wars,1918 to 1939, Second World War,1939 to 1945. Postwar era, called the jet age,1945 to the present day, aerostats use buoyancy to float in the air in much the same way that ships float on the water. They are characterized by one or more large gasbags or canopies, filled with a relatively low-density gas such as helium, hydrogen, or hot air, which is less dense than the surrounding air. When the weight of this is added to the weight of the aircraft structure, a balloon was originally any aerostat, while the term airship was used for large, powered aircraft designs – usually fixed-wing. In 1919 Frederick Handley Page was reported as referring to ships of the air, in the 1930s, large intercontinental flying boats were sometimes referred to as ships of the air or flying-ships. – though none had yet been built, the advent of powered balloons, called dirigible balloons, and of rigid hulls allowing a great increase in size, began to change the way these words were used. Huge powered aerostats, characterized by an outer framework and separate aerodynamic skin surrounding the gas bags, were produced. There were still no fixed-wing aircraft or non-rigid balloons large enough to be called airships, several accidents, such as the Hindenburg disaster in 1937, led to the demise of these airships. Nowadays a balloon is an aerostat and an airship is a powered one. A powered, steerable aerostat is called a dirigible, sometimes this term is applied only to non-rigid balloons, and sometimes dirigible balloon is regarded as the definition of an airship. The Avia BH-21, first built in 1925, was a robust biplane that served an important role in securing Czechoslovak national security during the period between World War I and World War II. As well as being a competent fighter, it was an accomplished racer, the BH-17 was actually only part of five Avia designs submitted to the Defense Department along with competing designs from the Letov Kbely and Aero companies. After extensive review, the BH-17, one of Avias three biplane designs, was chosen and limited production initiated for evaluative purposes, a special training version, designated the BH-22, was created. Both versions utilized 224 kW Hispano-Suiza 8fb engines built under license by Škoda, there were two experimental variants, BH-21J with Jupiter engine and a race plane BH-21R with boosted HS-8Fb engine. While in service, the BH-21 saw no combat as it was retired before the outbreak of World War II, in spite of this, it served as an important stepping stone to the more advanced BH-33 and BH-34 types. The stretched EMB-312H (s/n 161) had a more powerful engine and was dubbed the "Super Tucano". The A-29A incorporates an additional tank for 400 l of fuel. The spectacular low flying of the Golden Hawks is noted as an "altimeter check" by F/L Price at their RCAF Station Chatham headquarters. Golden Hawk Sabre displayed at the Canadian Warplane Heritage Museum, Hamilton, Ontario. 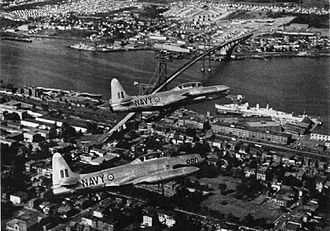 Two CT-133s of the Royal Canadian Navy over Halifax in 1957. 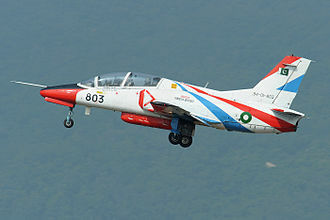 A K-8 of the Pakistan Air Force aerobatics team, Sherdils, takes off during the Zhuhai Air Show 2010 in China. A K-8 of the Bolivian Air Force. 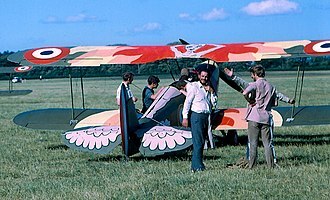 CJ-6 trainer now used for "Adventure Flights"
Lucien Chauviere, designer of the Integrale scimitar propeller for the Blériot XI. The Snowbirds flying their 1000th official show at CFB Edmonton (Namao), 20 May 1990. Coloured smoke was used during major performances that year. Aero L-39 Albatros, Patriots Jet Team No. 4. A T-35 Pillán formation of Chilean Air Force above Santiago, 2009.